Missouri goose hunting has the advantage of large standing natural and manmade water structures more so than Kansas or Iowa. Not all wetlands or crop stubble attract waterfowl. MAHA has been in the waterfowl business on the three watersheds that comprise the Lower Missouri River basins since 1965. Our wetlands and fields are placed along the major waterways where they combined into refuges and conservation areas making for vast areas of large standing water structures both man-made and natural with the surrounding areas of waterfowl attracting crop fields of both stubble and winter wheat. Selecting the right goose hunting location within this available habitat makes all the difference between seeing flights of waterfowl or blue sky. The lower Missouri River Sub-basins cover just about the entire western half of Missouri and in the watersheds lie great areas of natural and man-made water structures surrounded by farming. This accounts for our great waterfowl migration and layover. 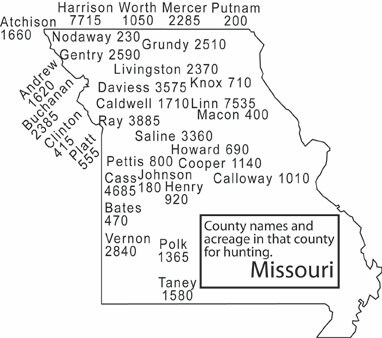 The three major sub-basins of the larger Lower Missouri River Basin are labeled on this map and is the region in which we have our best waterfowl hunts. No guides, no meals delivered to elaborate heated blinds. Our goose hunters are not paying for a guide to spot the geese and tell the hunter when to pull the trigger. We offer duck and goose hunting the way it should be. We provide the waterfowl productive habitat and the hunter provides the skill and the pride of a good do it yourself hunt along with it. Historically, our peak migration and best hunts are from mid November to mid December and continues later for Canadas and still later for Snows. 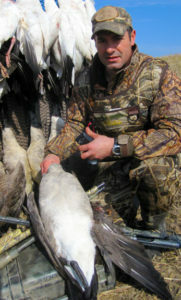 The return migration is as good as the southern migration on many years and the time the field hunters are most active. Our self guided hunter approach allows all to hunt the portion of the migration most preferred and to hunt as often as wanted.